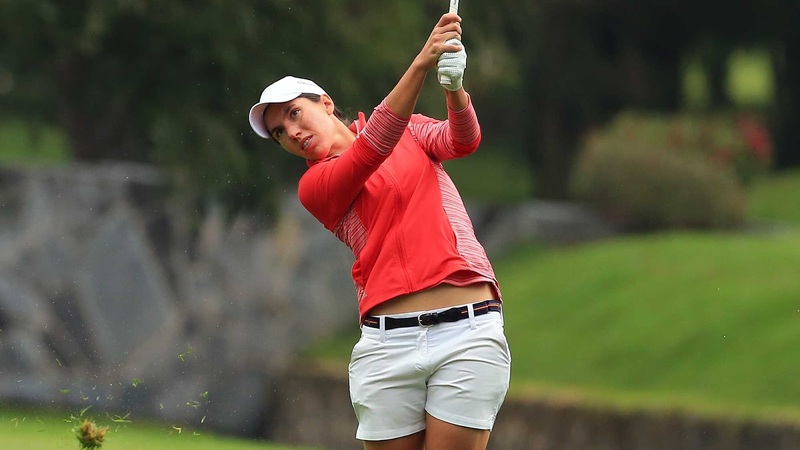 Carlota Ciganda of Spain hits her 2nd shot on the 4th hole during the final round of the Citibanamex Lorena Ochoa Invitational Presented By Aeromexico and Delta at Club de Golf Mexico on November 13, 2016 in Mexico City, Mexico. Carlota Ciganda is no stranger to the winner’s circle after picking up her first win on the LPGA Tour at the LPGA KEB HanaBank Championship. Ciganda (-13) shot a final round 68 that proved to be just enough to grab her second victory of the 2016 season as she defeated Austin Ernst, Sarah Jane Smith, Angela Stanford, Karine Icher and Jodi Ewart Shadoff by two-strokes at this year’s Citibanamex Lorena Ochoa Invitational Presented by Aeromexico and Delta. She had four birdies, an eagle and two bogeys on the day to finish at 4-under, hitting 10 of 14 fairways. Ciganda held a share of the first-round lead and coming from behind to win is not new for Ciganda having come from five-shots back to pick up her first win on the LPGA Tour in Korea.